Troll Bridge is an adventure in the style of the original Legend of Zelda. The main character is a troll who has escaped from slavery. By finding clues and collecting items, the character works to free his people. 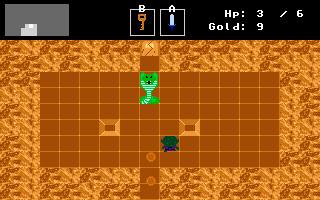 Although the core engine is done, monster AIs and levels are in need of much work. The game is currently not very playable. If you wish to help out please visit the game design section. Apr 19, 2019: Troll Bridge v0.5.6 released. Aug 28, 2016: Troll Bridge v0.5.5 released. May 24, 2015: Troll Bridge v0.5.2 released. Sep 10, 2002: Troll Bridge v0.5.1 released. Sep 10, 2002: Identical Software Graphics Library v0.8.2 released. Feb 11, 2001: Troll Bridge v0.5 released. Feb 11, 2001: Identical Software Graphics Library v0.8.1 released. Nov 25, 2000: Modules section added. Oct 30, 2000: Images of turtle boss put up on Monsters page. Oct 4, 2000: Open Game Source article on Fanwor released which includes a Troll Bridge conversion. Oct 2, 2000: Troll Bridge v0.4 released. Jul 23, 2000: Added .pcx to File Formats page. May 31, 2000: Minor fixes to the web site. Apr 26, 2000: Troll Bridge v0.3 released. © 2019, Identical Software. All rights reserved.